The recent announcement that a British museum will return two stolen locks of hair from a 19th century Ethiopian king was hailed as an "exemplary gesture of goodwill" by the Ethiopian Embassy in London. The hair was cut from Emperor Tewodros II's head after he shot himself rather than be taken prisoner by invading British forces. The forces attacked his fortress at Maqdala during Easter in 1868. Strands of the Emperor's hair were given to the National Army Museum in London 60 years ago. What makes these 151-year-old Ethiopian artefacts so deeply significant? The answer lies in Tewodros's subsequent symbolism and significance in the history of Ethiopia - historically known as Abyssinia - a nation that has faced vicious attacks from powerful nations, and still, stands tall in its independence. 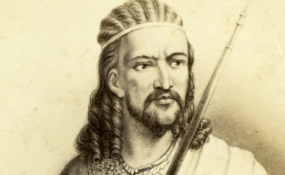 A ferocious warrior, Tewodros rose from being the son of a provincial chief to power, known as Nəguśä Nägäśt or King of Kings. Ending the chaotic period in Ethiopian history known as "Zämänä Mäsafənt" (the era of princes), he aimed to unify and modernise Ethiopia. ... when I told the Turks to relinquish the soil of my fathers, they refused, and so, by the power of God, here I am about to struggle against them. Out of fury, Tewodros jailed the British consul and other foreigners. His calculation was using the detainees as bargaining chips to secure the British support. However, his action led Britain to see Ethiopia as a "risk without profit". They sent 64,000 people (including 12,000 fighting men) under Sir Robert Napier, and invaded Ethiopia to face Tewodros. Called the Napier expedition, it's been described as the largest military offensive by the British empire in Africa. Rather than being captured, the emperor killed himself. But when he returned after the 1990s when the dictatorship had been deposed, a "heroification" of Tewodros had started - this, Marsden found, was necessary because of a vilification of the Ethiopian leader by foreign authors. It's quite debatable if there was such a dramatic shift in the Ethiopian perception Tewodros. Less debatable, however, is a clear difference between how Western and Ethiopian writers interpreted and portrayed the man. Like all interpretative projects, this one is not without ideological preoccupation. The Western authors wanted to caricature him in a certain way to justify the British looting of precious historical artefacts as "war trophy". Let's tie our covenant so we're divided more. Tewodros's sacrifice has ramifications to both Ethiopia's projection of itself at home and to the international community. In domestic politics, the nation has struggled with leaders who could not see beyond their personal enrichment. For those who failed to put the nation first, Tewodros still stands as a loud critical voice. As for international diplomacy, Tewodros symbolises Ethiopia - a nation that has faced vicious attacks from powerful nations, and still stands tall in its independence.